Candidates in San Bernadino for complete dentures have lost most or all of their teeth. A partial denture is suitable for those who have some natural teeth remaining. A denture improves chewing ability and speech, and provides support for facial muscles. It will greatly enhance the facial appearance and smile. Partial dentures are often a solution when several teeth are missing. Removable partial dentures usually consist of replacement teeth attached to pink or gum-colored plastic bases, which are connected by metal framework. Removable partial dentures attach to your natural teeth with metal clasps or devices called precision attachments. Precision attachments are generally more esthetic than metal clasps and are nearly invisible. Crowns on your natural teeth may improve the fit of a removable partial denture and they are usually required with attachments. Dentures with precision attachments generally cost more than those with metal clasps. Some people worry about how dentures will affect their speech. Consider how your speech is affected when you have a number of your natural teeth missing. Pronouncing certain words may require practice. Reading out loud and repeating troublesome words will help. If your dentures "click" while you`re talking, speak more slowly. You may find that your dentures occasionally slip when you laugh, cough or smile. Reposition the dentures by gently biting down and swallowing. If a speaking problem persists, consult your dentist. 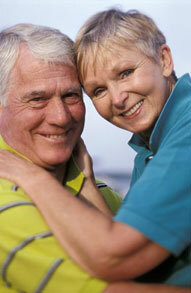 For more information on Dentures in San Bernardino, CA call My Dentist at (888) 599-7005 today!